In Ep. 045, Tim talks with Jeanette Pavini. Jeanette is a 2x Emmy-winning consumer and investigative reporter, and the national spokeperson of Coupons.com. They talk about ways to make the most of your money shopping this holiday season, and ways to start saving money even during the holidays. They talk about the benefits of coupons, and how technology has made it even easier to save money with coupons! Tim Mullooly: Welcome back to Living With Money. This is Tim Mullooly. 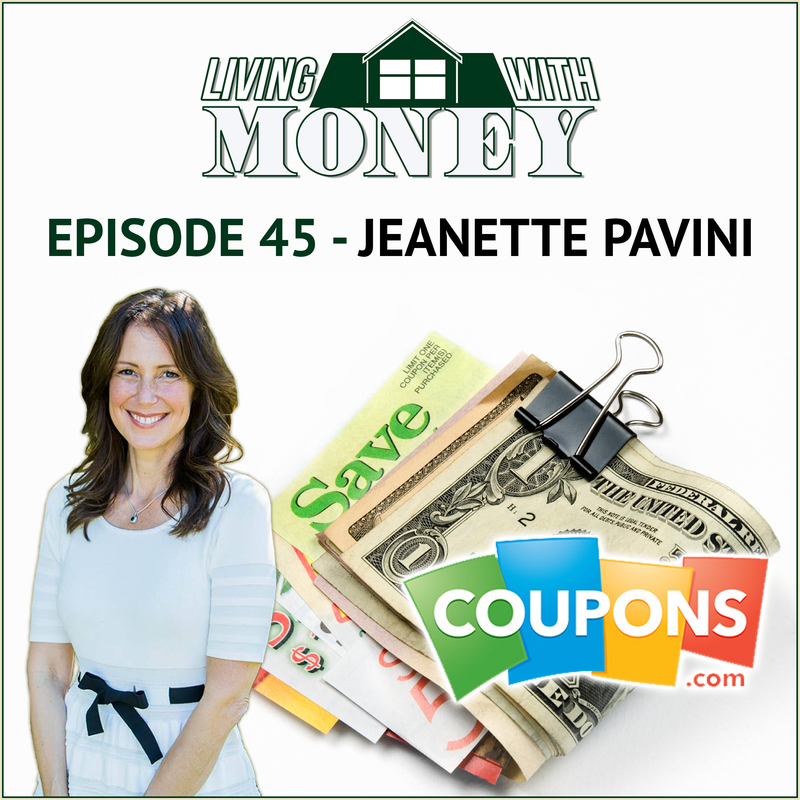 On today’s episode, I am joined by Jeanette Pavini. Jeanette is a two time Emmy winning consumer and investigative reporter, documentarian, author, and the national spokesperson for coupons.com. Jeanette, thanks for coming on the podcast. Jeanette P.: Well thank you for having me Tim. I’m happy to be here. Tim Mullooly: So for the listeners out there, can you just provide a brief insight into your background on yourself and how your career got started, how you got to where you are today? Jeanette P.: Sure. So well I’m a native San Franciscan, the youngest of five. I grew up with parents that were of the depression era. So we grew up definitely learning the value of a dollar and my dad was, I would say my first teacher when it came to learning about personal finance. He was amazing with how he would stretch a dollar. How he fed seven of us in our family and put us into private schools in San Francisco, and I don’t think he ever earned more than $45,000 a year at the time. He was just the master of it. So that’s where I got my first introduction into having a relationship with money and I started my career actually going on, on a local show and talking about ways parents could save money because I was a parent living in a city where it was relatively expensive. So I started doing segments on that and eventually I moved over to CBS in San Francisco, and they took me under their wing and taught me a lot about news. I started doing consumer stories, and I was there for 10 years. We had a great team. I think I did over 10,000 consumer advocacy stories and just personal finance and investigative pieces. And then after 10 years there, I went off on my own and I had a show called The Real Deal, which was all about money. Started writing for Market Watch and doing special things on behalf of coupons.com for the today show and Good Morning America. Really with the message of trying to help people to help themselves so they could help others, make it come full circle. Tim Mullooly: Over the span of your career. Going back to the very beginning, how have the problems that people faced with personal finance changed? Or have they? Jeanette P.: Yeah. So it’s interesting because I started in my career over 20 years ago. And prior to that, I experienced credit card debt and I experienced learning how to pay one bill and put off another bill. I went through it. I was a single mom at the time. So I really learned a lot about what are the biggest problems that I think everyday people face. And I think today, it’s still the same. I get so many letters from viewers or readers, and I will tell you that I think two of the biggest challenges that people face back then and today is A, credit card debt. Seems to be like a monkey on your back. It’s hard once you get in it to get out of it. And also I think people trying to figure out how to save both for their kid’s college and for their retirement. No one really is thinking of their retirement when they’re in their thirties, but they really should be. And sometimes it’s tough to do. So I would say retirement concerns and credit card have been consistent. The one thing that is different is there’s much more, because I do a lot of consumer protection stories. There’s a lot more scams that people fall victim to, and they’re goo those scammers. And so I would say that is the new thing that is, and it can rob people. I’ve done how many stories on this? And I actually fell for one recently on an email, and it looked so real. So I would say that’s the thing that’s changed is how people need to protect themselves. We never had this our information being stolen or things like that, that wasn’t here 20 years ago it is today. Tim Mullooly: Right. And that’s mostly because of technology changing, like you’re saying with emails and the hackers getting better and stuff that. Because of all the different changing technology. Jeanette P.: Yeah, because of the technology. And it amazes me. Scammers are good. They somehow figure out a way to get this hack in and get personal information. And I remember my first ID theft story was probably 20 years ago and it was about you not putting personal information into your recycling, into your blue recycling bins. So things have changed. Tim Mullooly: Yeah, certainly. So you mentioned credit card debt is a big one. Saving for college and retirement. If you had to pick one, what’s been the most frequent personal finance problem that people come to you with? Jeanette P.: I would say how to live within their means every month, how to have a monthly budget. That I would say was the biggest challenge then, it’s still the biggest challenge now. I get a lot of people asking me how do I make X amount work at when I have these expenses? How do I save for retirement when I have these expenses? I would say that’s the consistent. And credit cards work into that because a lot of people, their monthly income goes to their credit card debt. Tim Mullooly: Yeah. And it’s hard to, if you’re paying into credit cards, it’s hard to put money away for college or for retirement, other stuff like that. Tim Mullooly: So we’re coming up on an expensive time of the year for some people. Thanksgiving, we’re recording this the week of Thanksgiving, holidays right around the corner. Are there a few ways that individuals can maximize their shopping and saving experience during the holidays? Jeanette P.: Yes, you know Tim. There are some very strategic things that people can do. And I often say you don’t want your New Year’s resolution to be how to get out of my holiday credit card debt or my holiday debt. It wouldn’t be great? There’s three things that I would recommend that people do. Number one is plan, plan, plan. Just sit, and really pull out calendar and look and see what all the expenses are that you’re going to incur. Because there’s things, yeah we think of presents and we think if we have to go to a holiday party and bring a gift or a hostess gift. But I mean really think, are you going to be sending out Christmas cards, holiday cards, and spending money on those and on the postage? Do you have to ship gifts? Are you going to be driving or traveling someplace that you need to think about? Are you going to be having out of town guests come and it’s going to increase your energy and water bills during that time? Really think about all the expenses. And then once you have that, divide it up by weeks and try to see if there’s a way that you can set that money aside each week, and put it into a little separate envelope or account or whatever it is to cover those additional costs. But planning ahead for things travel is really how you’re going to you’re going to save money. The other thing is really don’t pull out the credit cards if you don’t have to. Don’t get gifts. Especially things like gifts. Get creative with gifts. Make fun little coupons that say good for one night have dinner at our house or good for babysitting your kids so you could go out or something like that. Get creative. You don’t have to spend a fortune on gifts. And waiting to the last minute, you usually will do that. So I think that those are the things, the planning and not pulling out the credit card are some of the things that you can do that will really help it so that you don’t go overboard for the holidays. That’s not what the holidays are about anyway. Tim Mullooly: Exactly. I think that that last point about getting creative, and I think that sometimes adds to the gift and makes it more thoughtful. Right? Jeanette P.: Absolutely. Okay. Here’s a couple of things that I’ve done in my years and I still do. Magazine subscriptions are so inexpensive these days. You can get magazines for a whole year for somebody for five, $10. And it is a great gift because it can target their interest, and it’s a gift that gives every month. Creating like I said, the little coupons. Good for taking a photo. No one really has photos anymore because everything in our phones. Printing one up for 25 cents or 50 cents at a local pharmacy drugstore. And then getting an a $3 frame and making it a gift. Stuff like that is so thoughtful. And you’re right, that is what people remember. Those kind of gifts. Tim Mullooly: Right, exactly. And it might not be the most expensive gift out there, but a magazine subscription, it shows that what their interests are and you actually know something about them as a person. Jeanette P.: Absolutely. It’s great, and they get a little reminder every month of your thoughtfulness. Tim Mullooly: Back to that first point about planning. There really are so many unexpected expenses that come up. Obviously the main ones are the gifts that everyone thinks about for each person. But there are a lot of things that go along with it like you’re saying. Jeanette P.: Oh yeah, there’s a lot of things. It’s those little things that add on that are really going to cost you. And I’m guilty of it myself. If you’re going to bring a bottle of wine let’s say because you have a couple of events to go to, don’t wait to run to the corner liquor store to buy that wine the day of because you’re going to spend twice as much sometimes. Plan ahead, think about these things. I will tell you one thing I do is right after Christmas or after New Year, I go buy little holiday things that are 75 percent off and I have a hostess gift shelf in my closet that I keep all these great little hostess gifts. I just did it the other day when someone was invited us over and it’s so inexpensive to do that way. It is thinking ahead, thinking ahead and having a plan is really what it takes to make that change. Tim Mullooly: Yeah, absolutely. And I am totally guilty of doing that as well. We talk about all these tricks and tips and then I myself always forget them every year. Even though without fail, Thanksgiving and Christmas, New Years. They happen every year, but I forgot about them. Jeanette P.: Tim, I’m guilty of this too, although I have gotten good with the hostess gift thing because you just, it was like oh my God, I’m spending so much money on this. But a lot of my tips come from me learning the hard way. Tim Mullooly: Same here. So we were talking about scams and the hackers before. Naturally that leaves some people resistant to wanting to put some of their financial information online. Are there a few ways and benefits of keeping track of your finances online, and ways that people can safely do that? Jeanette P.: Well it’s funny. I have kept a monthly budget. I grew up with a father who literally had a monthly budget for the 60 years that he worked. He knew exactly every week what he made, what went into what … He was amazing. So I still to this day keep a monthly budget that it’s in a binder, a ledger. And it works for me. That doesn’t work for most people. But one thing I would recommend is there’s some great software, there’s some great even in an excel spreadsheet to keep track yourself of a budget so that it’s personal and you don’t have to put it out there. There are some good financial programs out there that you can create a budget around, you can look into those. I always recommend to people before you do any of that is to find out what, what type of security measures they take, how protected your information is. And be hesitant to give too much of your personal information onto online just for a budget. I mean, you have to do it with our banking. There are ways that you can do it yourself and hold onto it in your own budgeting system. But I think if you check out what their policies are and what they have in place to protect you, that’s the first step. But again, I personally am always hesitant to put too much of my personal information and account numbers into a lot of those. That’s just me personally. Tim Mullooly: Right. Yeah, I agree. I need to make sure that the site or whatever program I’m using is trustworthy before I put some serious personal information on there. But I totally agree. Excel is one of the greatest programs I think out there. It can help you with so much in terms of keeping track of anything in your life. Jeanette P.: Yeah. This is what I have found over the years when I’ve done stories where we’ve gone out to people’s homes and done a big money maker over for them or something. Really people have no idea. They know what their mortgage is or the kids’ tuition, but they don’t know what they’re spending on groceries. They don’t know what they’re spending on their gas and electric. They don’t know any strategies to lower those things. So really an Excel spreadsheet will be eye-opening for people if they truly follow what goes out, and what comes in. Tim Mullooly: Yeah, there are a lot of people out there who have trouble saving money because of reasons this decides inputting, keeping a journal, using excel. Do you have any other tips or useful tricks that people can employ to help them get the ball rolling in terms of saving money? Jeanette P.: Sure. There’s two things. The first is, and I often start with this. The past is the past. Any mistakes that have been made financially, we’ve all done them myself included. It’s to really make peace with it because a lot of people, my God I have talked to so many consumers over the years where it just hangs on them and they can’t let it go and they’re bringing it forward. Just make peace with it. Nothing can be done and it’s all about moving forward. So that’s the first thing is getting into a positive frame of mind. Especially coming into a new year, this is a new year coming up. I’m going to make changes. I’m going to be strategic. And there are tricks, right? There’s things you could do to lower your energy bill. The energy companies have great calculators to help you, tips to help you. Take advantage of it. There’s ways, and things when you’re at the grocery stores You had mentioned coupons.com. It’s amazing how much money you can save just by using a loyalty card and coupon. You could slash your bill in half sometimes. So looking at each category and saying what can I do? That’s how you’re going to A, be aware and have a relationship with your money. And B, you’re going to take control and bring those things down which will allow you to start saving money. And one other quick little thing, things like eating out. That’s where a lot of people spend money every day buying their lunch. Something like that. Changing, buying your lunch out every day and brown bagging it three days and only buying lunch two days, that can save you significant amount of money every year. Tim Mullooly: Yeah, absolutely. And then it gets to that question of need versus want. Once they determine this is a need versus a want, they can determine where they’re spending their money and spend it on stuff that actually means more to them versus just wasting away on things that don’t matter. Jeanette P.: So there is a big difference between need versus want. And when you look at the things that you need and you make adjustments to how you can save money on those things, then that’s set. And then what we want. And I mean sometimes it’s important to get things that we want. Just you’re working so hard to have a little reward. But I think what’s the most important thing is that if you want something that it’s really well thought out, that it’s not an impulse, that it’s not just because something’s a deal that you can’t pass up, that it’s not because you’re trying to keep up with the Jones’s. Those aren’t really good reasons to want something, and you have to get to this place where your want for a retirement, or your want for money in the bank, or your want to have a savings to reach a big need that you’re going to have. That those wants are more important than your impulsive wants. And when you get there, it’s almost a freeing. It’s just very freeing. If you want something, put it on a long-term goal thing. I want to take this impulsive trip to go to Hawaii. Well maybe that’ll be a year from now and I’ll put that on my goal list. But what I really want more than that is to make sure I have some money for when I retire. So I’m going to start a retirement account. Get excited about those things. Create your wants into needs. Tim Mullooly: Right. It’ll definitely help keep those impulses in check, right? Jeanette P.: God, yes. Impulse. And that’s when we usually pull out credit cards. It’s a downward spiral. Tim Mullooly: Yeah. Once that ball gets rolling, it’s hard to stop. Jeanette P.: Stop it. Credit card debt it’s so hard. I’ve been there when I was in my twenties, I had it and I know people that that is the only way they can survive and I get it. But you have to try to take control over it. Tim Mullooly: Kind of working off of that, you said you had credit card debt yourself and a lot of people struggle with credit card debt. For you, what was the best way that you found to work your way out of credit card debt and how can people do the same for themselves? Jeanette P.: Well, I think the first thing is to stop using them number one. The second thing would be to call your credit card companies. Talk to them, explain the situation you’re in, see if they can lower the interest rate. A lot of them do. Kindness counts if you explain the situation. And also start looking into one credit card that has a low transfer balance, a really great deal. Look for loopholes, but you want to if you can open a credit card that you could switch and have one that has maybe zero percent interest on transfer balance or one of these attractive types of offers to start on a new foot with your credit card. If you don’t have that, just make sure no matter what you make the payment. That’s the most important thing. The minimum payment. Tim Mullooly: Absolutely. Yeah you don’t want to fall behind on that because that’s when the interest kicks in. Like you were saying though, sometimes calling the credit card company, people are surprised to hear that that actually works sometimes, and they sympathize with you and there is some wiggle room there for some people. Right? Jeanette P.: Absolutely. They’re people too. They get it, they’re there. They just want to work with you on collecting the debt. And especially if you are in a situation like for example, people going through the fires in California and this type of thing or if you’re going through a health crisis, anything like that. Just call and talk to them and explain where you’re at and what you need and how they can help you. You’d be amazed at how a lot of them will try to help you. Tim Mullooly: Right. And it’s worth a shot because the worst they can say is no. Right? Jeanette P.: Exactly. Exactly. That could happen too. Tim Mullooly: Well, yeah. But then you’re not worse off. At least you know that’s not an option. Jeanette P.: Yeah, exactly. So it’s worth a try. Tim Mullooly: So we mentioned it a couple times. Coupons.com since 2009, you’ve been the national spokesperson for coupons.com. Do you want to a little bit about what you do with coupons.com and how that all got started back in 2009? Jeanette P.: Sure, yeah I’d love to. So I had back then a show called The Real Deal, and it was airing on our local NBC station here in the Bay Area, and I went to coupons.com because liked their story. It was a great story where the CEO had was on his in laws house 20 some odd years, maybe 22 years ago. He saw his father in law going out to get the paper and cutting coupons and this and that. He thought there must be a better way. There has to be a better way. And he developed coupons.com where you could get coupons 24/7. You didn’t have to wait for the Sunday paper to come to get your coupons. So I liked their story, I liked them and I met with them actually to talk to them about doing some segments on my show on cooking. Real deal meals, we were going to call them. And they did those, but when we were in the meeting they said, we talked and we liked each other. They said, “Would you want to help us with our national spokesperson? This is what we’re about.” And they were all about helping people not just with grocery shopping and coupons, but in every aspect of their household budget. And that was my thing too. So it was a perfect marriage. What we both believed was important and how the simple things can make the biggest difference. I grew up with coupons. My mother used coupons. I still use coupons. I look at it as almost free money, and we had a very similar outlook on how people could get control of their finances. And I liked them and they liked me and yeah, it’s been a nice relationship for many years. What I do for them is all of their media and I write for them, and get the message out there of how people can get control, especially of their grocery bills. And they really can. I’ve learned a lot over the years on how people can get control. Jeanette P.: It’s amazing. And now they have the coupons.com app which connects to loyalty cards. Do you use your grocery store loyalty cards Tim, do you use those? Jeanette P.: Okay good. You’re halfway there, my friend. So now imagine combining that with coupons to save even more. So it really is strategically one of the best ways to save money. And I’ve done so many segments on this. I’m worked with so many families where we save anywhere from 40 to 50 percent on average. It’s pretty great. That’s a good place to get control. And then of course, online shopping is so popular. You should always check for coupon codes. I was looking at our site and some of them, especially around the holiday time, you can find just about anything to save money through a coupon code. So it takes a couple minutes to do it, but if you can save money, why not? Tim Mullooly: Yeah, absolutely. And I feel like everyone’s always looking for that life hack or the easy way out to save money, and it’s right there in front of them. Got to do a little bit of work. Jeanette P.: Yeah. Maybe 20 minutes. I probably spend 20 minutes planning my menu around what’s on sale at my grocery store. Then I find the coupons in the coupons.com app. I haven’t connected with my grocery store, my loyalty card. And when I go, I tell you one of the biggest thrills is watching the registered minus, minus, minus. I just love that. It’s a great way to feel like you’re in control of your money. It’s very strategic, and I often save probably for the two of us probably 50 bucks a week at least, maybe even more. So I often say if you’re walking down the street and you saw a couple twenties on the street and no one was around that claimed them, would you walk by or would you pick it up? Because that’s what the feeling is. It’s like free money. Tim Mullooly: Exactly. That’s a good point. Everyone would pick up the twenties. Tim Mullooly: So I saw an article that you wrote I think on coupons.com back in October, and the title was how to trick yourself into saving $700 plus every month. Sounds a pretty useful trick that I’m sure everyone would. Do you want to tell the listeners a little bit about that article and how they can trick themselves into saving all that money? Jeanette P.: Right. So it’s again, the small things that add up, right? And I think if you develop these systems and you follow the rules to it, you you’ll be amazed at what you can save. Okay. One of the things that I do is I always pay up, I don’t use change when I’m buying things. So I’ll pay up so that I get change back and I put my change in a jar. One month I saved $60 just through our change, which is, that’s a nice little thing that you don’t even notice. These are things that you could do that you don’t even notice. When you’re paying your bills, one thing to do is let’s say I don’t know, your car payment is $358. Take out 400, pay the 358, and then pay up to 400. Round it up to the next big amount and take that amount and put it into a savings account. I have been doing a transfer, an automatic transfer of $50 every two weeks, so it’s $100 a month. I’ve been doing this for so long, just automatically comes out of a paycheck or out of my account every single month. And I do it, what’s that? $25 a week, I do it weekly. I set it up years ago. I have so much money in that account that I never, it’s probably 15,000 or something. But I started it so long ago, but that’s how quickly things can add up. Another thing that I’ve done and it works is let’s say you’re making a car payment or you’re making some kind of a payment and it ends. Just continue making that payment. A you’re used to it and it’s built into your budget, and just slide it over. Just slide it over into your savings account. And then things like postage. It amazes me when you’re mailing in bills or you’re mailing things, how expensive it is. Startup, set up the bill pay online so that you don’t have postage. That can save you five bucks a month, something like that. It’s all these little things. And then one other thing, I don’t know if I had it in that article, but I really, really want to go back to is how much we spend on lunch. I did a big research survey on this years ago and it was amazing. Most people buy their lunch when they’re at work, and they spend on average across cross country, it’s $11 a day. So if you were to just plan ahead and get your things at the grocery store, use what’s on sale and coupons, you can bring that same type of lunch down. I think it was, we brought it down to a $1.98 or something for a similar lunch. So things like that, and then just put that money, that $9 that you’re saving the day and throw it into this account. And even if you throw the cash or something into an envelope and then just cashing in at the end of the month. Those are the ways that it adds up, it really does. Just like using a credit card for $10 a year and $20 and then we get a bill for thousand dollars. What did I spend a thousand dollars? It’s the same thing. It’s the reverse. It’s like wow, how did I save a thousand dollars? Tim Mullooly: Right. And I do that with change like you were saying. I feel like for me, I always found that a lot of change just went unused. And one day I kept it all in and it was a couple hundred dollars. I had this big jar sitting in my room and I was like, “Oh my gosh.” So I totally agree. Things that a little penny or a dime, just one of them doesn’t seem much for people. But if you just hold onto them and eventually cash it in, it could really make a difference. Jeanette P.: It really does. Tim Mullooly: I saw a video where you were talking about why printing out coupons that you find online is a good idea, a safe idea. Can you talk a little bit about how or what the best way to use your coupons would be? Jeanette P.: Sure. So there’s two ways basically that you can get your coupons. You could, for example, at coupons.com that you could print them up or you could save them directly to the loyalty card. I find the app is the easiest way to do it. It’s super consumer friendly. So you can print up coupons. We have it on our site at coupons.com where you can print them up directly from the site or you could do it in the app, and you could save it directly to your store loyalty card, which I find is easier because at the end when you go to checkout, everything’s connected to your loyalty card. All the coupons that you’ve wanted and all the store specials that you wanted. So that’s the easiest way to use it. I think the most important thing is if you’re printing it up to remember to bring them with you because and to bring them into the store with you because nine times out of 10, if you forget them you’re not going to run out to the car and get. So have them with, you have them organized. But if you do have a smartphone and are able to use the app, I recommend that that now is such perfected in easy technology to go that route. And that way it’s always with you. You could even do it while you’re in the store. You could go into the app and say, “There’s a coupon for this.” It’s quite easy to use. And also again, as we’re approaching the time of year when we’re going to be spending a lot of money online, to definitely utilize coupon codes. And coupons.com has a lot of coupons. But also follow your favorite stores on their social media. Because a lot of times they’ll have special coupon offers for people that follow them on their social media. Take advantage of their loyalty programs, because when you combine it all the way around, you get a lot of good discounts. One other thing about the coupon codes, it takes a second to find them. And nine times out of 10 you will find something that will help save you money. Tim Mullooly: Right. Yeah I’ve noticed that a shopping online over the years as well. There’s usually a coupon code for something that you’re looking for. Like you’re saying, not leaving the coupons in the car. Just using the app like you’re saying. No one leaves their phone in the car, so you’re going to have it on you. That definitely makes it easier. Jeanette P.: So much easier. It’s so easy. I am not a tech savvy person. I really am not, and this is the easiest app I have to use. It really is very easy to use. Tim Mullooly: So I like to ask most of the guests that come on here as we’re wrapping up, whether it’s personal or professional, what’s one piece of advice that you’ve gotten over the span of your career or over the span of your life that’s always stuck with you? Jeanette P.: It would be from my father. I remember he always used to say two things. One was, “In my day we’d earn a quarter, we’d spend fifteen cents, and we try to save a dime. But your generation, you earn a quarter, you spend that quarter and then you borrow another quarter at 20 percent interest.” I loved my dad, he was so cute. And it always made me think, yeah why would I want to be paying money on money? And also it was always he’d say, “It’s not how much you earn, it’s how much you save.” And those just set in my mind. And again, I have not always been the best at personal finance, but those things have really stuck with me. And the one thing I would say over my life and through my career is where I see a shift in people with their personal finance. I think it’s tougher now today than it was ever has been. And that is developing a relationship with cash. We don’t use cash anymore. I’m guilty of it. Probably we all do. We buy a cup of coffee, we use our credit card, our debit card. Sometimes we go shopping, we just hand over a credit card. We don’t even see what we’re spending. I often think if we had to turn over $100 bills or $20 bills, would we buy those things? We don’t really have a relationship with cash. We get our credit card bill at the end of the month and we’re like, “What did I spend $1,500 on?” And so I think if I had to give advice, that would be best tidbit of advice is to develop a relationship with cash. Know what’s coming in, know what’s coming out. Don’t be afraid of it. Be aware of it and try to actually use that more often. And you will save more money than you can imagine just because you will hold onto it more. So relationships, banking relationships with real people. Like I said, calling credit card companies. Really adding a personal touch to our personal finance. It’s almost like the word personal is not there anymore. So that’s what I would see. It’s like game on let’s, let’s do this. We have power of it, we have control, but let’s have that relationship because it’s not a piece of plastic that you’re going to have the relationship with. It’s the hard earned cash that we work so hard for that you have to have that relationship with. Tim Mullooly: Right? Yeah. And I think that that piece of advice like you’re saying, ties back into what your dad said about spending a quarter, borrowing a quarter ago. Just the whole concept of going into debt needlessly. Jeanette P.: Absolutely. How he did it, I’m in awe of him. What he did and how he saved. And yet he lived a great life and he had a full life, but they learn to make do. And it was going back to what you said, need versus want. Tim Mullooly: And it kind of ties back into that point that you made in the beginning about people coming to you needing to learn how to live within their means. It’s hard for people to do, but if you can figure out how to do it, you’ll be much better off. Jeanette P.: Exactly. And to not be afraid of it. And to one other thing Tim, is to take advantage of programs out there that help you if you’re in debt. There’s legitimate, really good nonprofits, those are the ones that you want. You don’t want ones that you have to pay a huge fee for consolidation or anything. People that’ll help you or take advantage of the library, or any community things or experts. Call your gas and electric company. Ask them what programs are available. Really become empowered. People can do this. And it’s just taking our head out of the sand and having that relationship with cash. We work so hard for it. Tim Mullooly: Yeah, exactly. You want to use it to the best of your ability. Jeanette P.: Yeah, absolutely. And we can do it. Tim Mullooly: So Jeanette, that was all the questions I had for you today. Thank you so much for coming on the podcast. Jeanette P.: Thank you so much. I appreciate your allowing me to talk, and it was a pleasure. Thank you. Tim Mullooly: So for the listeners out there, any articles that we talked about here in the episode, we’ll link to in the show notes. We’ll link to coupons.com as well, so you can start looking around that site and utilizing all the useful coupons out there as well. So that’s it for this episode of Living With Money. Thanks for listening and we’ll see you on the next one.